A graphic novel which examines the impact of Social Anxiety Disorder on an individual's life in a blackly humorous manner. 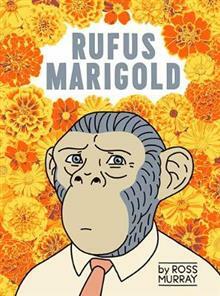 Rufus Marigold is a primate with a problem. He suffers acutely from anxiety and every social encounter is a harrowing ordeal. A budding artist, Rufus spends his days working in an office.As life become increasingly more of a struggle, Rufus yearns to be defined as something other than an a complete nervous wreck. This volume collects and significantly expands upon the original web comic, resulting in a darkly hilarious yet moving account of living with anxiety. Ross Murray is an illustrator based in Mount Maunganui, New Zealand. After studying graphic design he developed a diverse range of styles while working as an inhouse artist at an Auckland ad agency. These days he's most well-known for his colourful comic book-inspired artwork and his `vintage travel'-style illustrations, including covers and internal work for the ongoing Lonely Planet `EPIC' series. Ross is also a picture book author. `Rufus Marigold' is his first graphic novel. He spends most of his spare time trying to remember to breathe.